Currently there are no laws around the selling of animals online. With the UK in the midst of an equine welfare crisis involving too many horses and not enough knowledgeable homes, the ease of online buying and selling is causing some horses to fall into inappropriate hands and an uncertain future. Horse charities are left to pick up the pieces, putting their limited resources under serious strain. To obtain a clearer view of the numbers and types of horses currently seeking homes via online platforms, Blue Cross recruited a team of volunteers to track six equine classified websites and Facebook, over a period of 12 weeks during August to November of 2017. A total of 3,340 unique selling adverts were tracked over this time and the contents analysed. While 76% of all adverts described a riding horse or pony, 28% of all adverts used terminology that implied the horse was not straightforward, needed work, was young and inexperienced, or displayed behavioural problems. Amy West* (not real name) is one such owner. She bought a 17.1hh Irish Draught X via an online advert. He was sold as having been backed as a three-year-old and left to mature. He was described as easy to handle. Amy, who is an experienced rider took things slowly and gave the horse six months of groundwork training but he took off when long reined and bucked his rider off persistently. 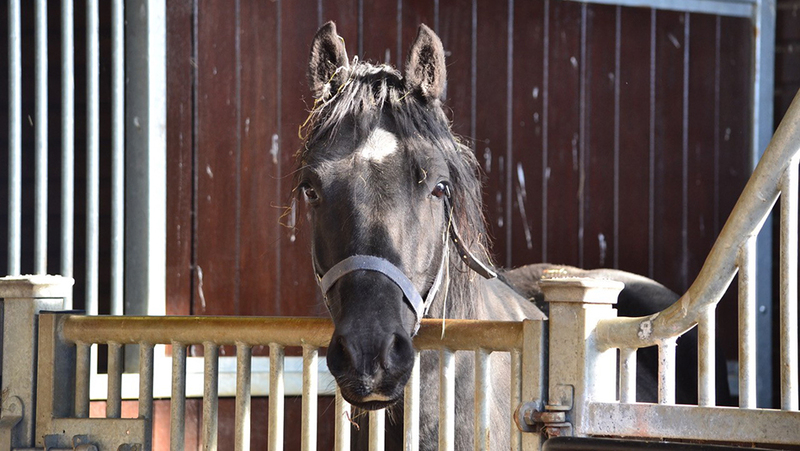 Amy eventually uncovered the horse’s past and found that he had been in several loan homes and had been taken back by the seller because of behavioural issues. Blue Cross also identified the promotion of breeding as a cause for concern in online advertisements. Although the number of horses listed with a potential use for breeding was small, at 1%, the quality of such adverts flagged health and welfare concerns. Blue Cross is currently campaigning for urgent change legislation to protect the tens of thousands of small animals sold online each year. While the charity is aware that the breeding and sales of horses holds many differences to the sales of small animals such as dogs and cats it believes that the horse sales situation in the UK needs a form of regulation. Further research: Investigate other selling mechanisms for horses such as auctions and markets, to build a fuller picture of the UK’s horse market. Legislation: Continue to push government to develop regulations around online sales of pets, to help safeguard horses health and welfare alongside other species. Education: Develop further education on the responsibilities of owning a horse and what to consider before people take that next step. Create practical tips for people who look to purchase a horse online, to help ensure an informed purchase process. Explore best practice: Look at horse ownership legislation in other countries to share best practice and ensure our UK horse industry isn’t left behind with the development of forward thinking strategies to improve horse ownership and welfare.